Note: I’m assuming you have a passing familiarity with React or other React like frameworks. A component only needs a view method that returns a virtual element or in this case a string. Components are loaded via m.mount() (similar to other frameworks). There’s very little boiler plate required to bootstrap a Mithril application. A one-line “Hello World” program is fun but are hardly illustrative of Mithril capabilities. Here’s a more canonical example with, “Hello World” embedded in an <h1> tag. Virtual elements can have child elements. Components are referred to by value (not strings). Let’s get slightly more ambitious and process some form data. This example extends our component to include an input box. As you type in the input box, the contents are echoed back. Virtual elements can have children. Child elements are expressed as an array. Literal strings are, um, err, literal strings. Components simply reflect the state of the model. Mithril does not have an eventing system. Use DOM events. Redrawing occurs automatically for mounted components on events (oninput in this case). For the sake of brevity I’m using a simple global data model, youSaid. Next let’s look at how Mithril handles iteration. We’ll take the example above and have it split the input into an array of characters and put those characters into a list. Let’s add a button to reset everything. Mithril does not have an eventing system. Use DOM events (I know, I said it twice). If a component has several distinct parts I like to break it up into additional components. Let’s separate the button control into a new component. Components can include components (m(clearButton)). Constructing new components requires little ceremony. If we remove youSaid dependency from the clearButton, it becomes a reusable component. Properties can be passed to components. youSaid has been changed to a getter/setter function. To retrieve the current value use youSaid(). To set it use youSaid(value). It’s standard practice to use m.prop() in Mithril programs. Although not required it is helpful in many use-cases. You can read more about the design motovation behind m.prop() in Mithril’s blog. You may be wondering what the _ parameter in view is for. Mithril components can have an optional controller function which is later passed to the view via the first parameter. We’re not using controllers in these examples so I’m using an _ to indicate it’s not used. Mithril’s constructs encourage reuse (actually, it makes it downright fun). Just for fun, let’s break the other parts into components. It’s easy to reason about and refactor components in Mithril. Composition using components fits nicely with rendering HTML. Mithril has a concise high-level utility for working with web services called m.request. It even supports JSONP. It also contains a routing system (m.route()) to help create Single Page Applications (SPA). There’s a simple but effective promise system to handle asynchrony. The documentation is outstanding. It’s written by hand, not generated from code. The author has done a great job explaining how the API’s work and the motivation behind why it works as it does. It’s fast. It most cases it’s much faster than React. You can see the benchmarks on the web site. Repaint Rate Challenge also has some interesting benchmarks. Like all benchmarks, take them with a grain a salt. My take away is that framework performance is not an issue. The Gitter chat group is helpful and friendly. If you like using JSX, there’s an MSX tool for Mithril that does the same thing. Templates can be compiled for that last bit of performance tweaking. Works great with Typescript. Mithril has a type definition file in the respository. The wiki contains lots of other useful stuff like Recipes and Snippets. This was a whirlwind tour of Mithril that skipped over many aspects of the framework. Hopefully I’ve shown enough here to peak your interest without overwhelming you with details. 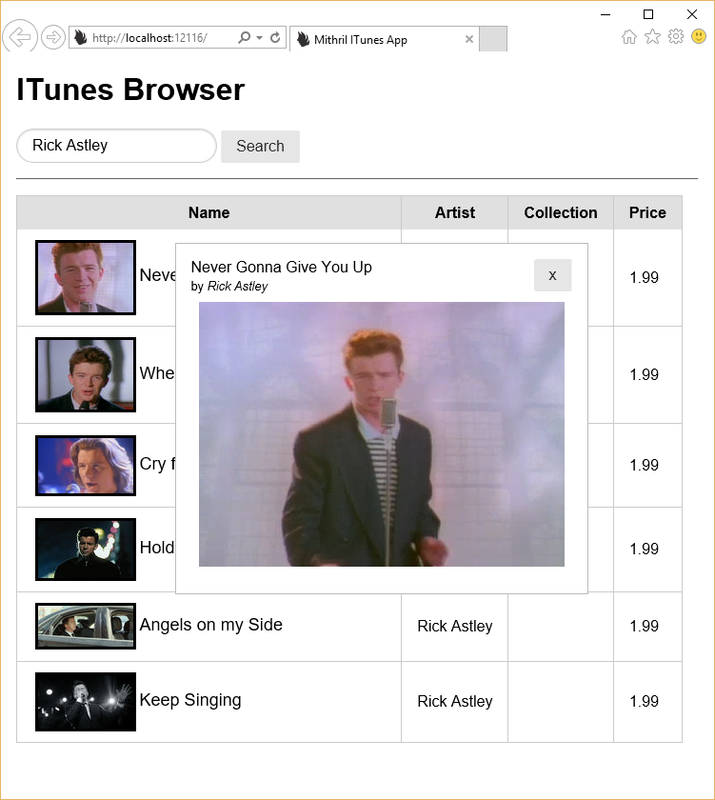 Finally, I’ve put together an example of a rudimentary iTunes browser. This is the standard little toy application I write when I explore a new framework. It demonstrates, in a bit more structured way, forms processing, table generation, micro-service requests, column sorting and even a fun little video player.